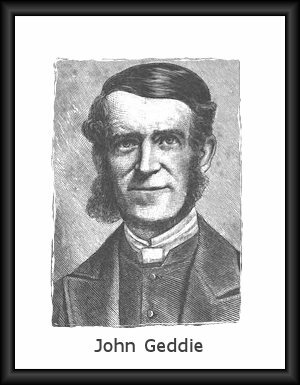 Born in Scotland, John Geddie (1815-1872), was brought by his parents to Nova Scotia, Canada in 1816. Began ministry as pastor at Cavendish on Prince Edward Island. Sent in 1846 as a missionary to New Hebrides (Vanuatu), where he served for over twenty years. Married Charlotte McDonald in 1839. They had four children, three daughters and a son. John Geddie: Messenger of the Love of Christ in Eastern Melanesia.